When Dee McGraw began college at the University of Alabama years ago, she never envisioned actually working for the University post graduation. While working at the Capstone, McGraw met her fiancé at a football game at Bryant-Denny Stadium. 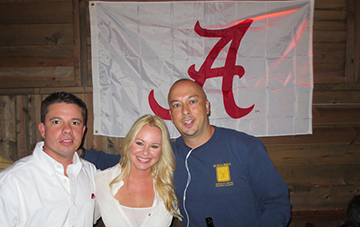 “When Alabama football is involved, you know it is fate, right?” said McGraw, who is now the University’s new regional recruiter for New York City, Long Island and the state of Connecticut. In her new role, McGraw is able to stay directly connected to the University by sharing her experiences with prospective students in this region while recruiting them to attend Alabama. So how does the Capstone stand out from dozens of other tables in a crowded career-day auditorium? As in football, there’s power in rankings. The public relations program has ranked as a top-five finalist for PRWeek magazine’s Education Program of the Year for five straight years. Culverhouse’s Management Information Systems program was ranked 16th in the nation by BusinessWeek. The entire university ranks 32 in US News & World Report’s rankings for public schools (and yes, Auburn was 37). “At Alabama, we embrace diversity and welcome opportunities to show the rest of the country that we are not the same university today as we once were years prior. Over 50 percent of our freshmen class came from out-of-state last year,” said McGraw. While attracting many “out of towners” is a great accomplishment, there is still the challenge of overcoming the distance and out-of-state tuition. In regards to what alumni in the New York City, Long Island and Connecticut area can do to assist recruitment, we all know how important it is for prospective students to hear from alumni about their college experiences. When asked about new initiatives McGraw intends to bring to her new role, she quickly suggested the alumni chapter become more involved in the annual recruiting receptions along with other activities.